I got to spend the weekend over on the west coast visiting some friends and holding adorable babies and had an amazing time! One of my favorite parts of getting out of town for the weekend is getting to go out and experience new places. One night we decided to go out and get something for dinner and have a few drinks, nothing crazy but enough to get a little dressed up. 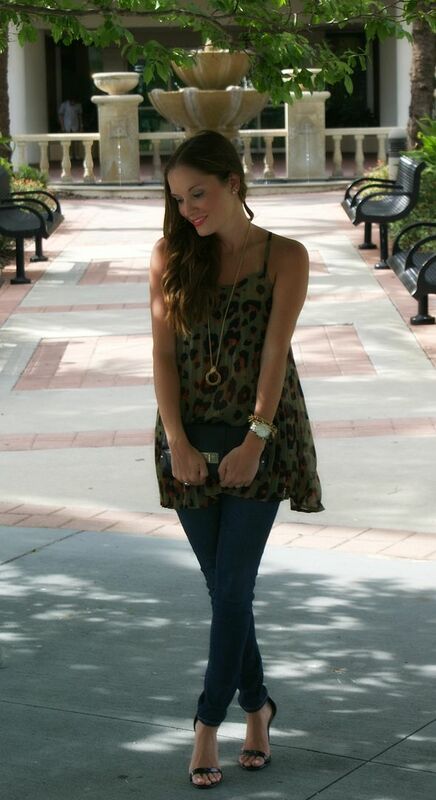 I bought this pleated olive leopard print top from Sophie & Trey months ago but I'm still loving it! I wore it during the fall/warmer winter days with a leather jacket and it was super cute but I was excited to get to wear it out without a cover up to keep me warm. I love the olive color with the orange and black instead of normal leopard print colors and I love the pleats and semi-sheerness of it. It's perfect for going out to dinner so you don't have to worry about that uncomfortable feeling after eating too much (which I ALWAYS end up doing but who can say no to pulled pork macaroni and cheese?!). Lately I have been obsessed with SO many things on Sophie & Trey's website. They have so many awesome dresses (including tons of cute maxis which I obviously need them all!) and adorable tops perfect for spring and summer. I love how reasonably priced everything is too! If their prices and adorable stuff isn't enough, they've been kind enough to extend a 10% off code to all of my readers for the entire month of May for all online purchases over $50! Oh and did I mention free shipping? I love a good sale! :) The coupon code is STPAMELA so get to buying everyone and don't forget to let me know what you get! I love anything leopard, I'll have to check out that website to see if I can put the code to use! Cute outfit! I always love a good leopard top! I love your look! It looks great on you :) I love the leopard print! Pulled pork mac and cheese?! Ummm ya I wouldn't have been able to say no either haha!! Love the top - my mom bought me a similar blouse so I'm trying to figure out how to wear it haha!! I'm still obsessed with your lipstick color - so pretty!! Thanks Kerri!! Hahaha I never noticed that before but yup, I believe it! To us the west coast is the west coast of FL but I guess to most it's Cali haha! Adorable! Loving the flowiness and print of that top! i love the color of that leopard pattern...does that make sense? hehe. Haha it makes perfect sense! Thanks Elle! i have never heard of sophie & trey but now i want all of the things! stop it, im trying to NOT spend money girly! that top is so cute though, i love the colour. and your jeans. stop being so flawless, missy. hope you had a fab weekend, those babies were so adorable! What a pretty top! I especially like the color of the pattern! Such a beautiful look to start the week, love your top! Great look... love the heels! I can't get enough leopard, love the top. I have a scarf very similar. Sounds like a fun weekend! Haha I definitely can't say no to mac and cheese! And I know, Sophie & Trey seriously has the cutest stuff, it's not fair! Thanks love!! I love this outfit! And I have to say, you always have the best lip colors! i.love.the.outfit.today!!!! So fun and soo comfy!!!! Ugh it was SOOOO good Katie! If you find one, let me know!! sooo cute i love that tank i especially love the heels! Thanks Meg! The heels are surprisingly comfortable! Always the cutest. I'm glad you were able to get out and explore! You can never have enough tops - especially in leopard! That's my motto and I'm sticking to it (and hoarding away) ha. Ohhh love the shirt! I'm off to check out some maxi dresses now- thanks for sharing the code! So beautiful! I adore that top, it is gorgeous, especially the pattern. Love this outfit! The top looks so cute on you and so excited to see your apart of the affiliate program!!! Love the unexpected colors in this leopard print! Thanks Meghan!! Can't wait to see what you get!! <3 And can't wait to hear all about your bachelorette party! Adoring everything about this look! Stunning! Love the top and the lip! Gorgeous!! Omgsh could you be any more gorgeous?! LOVE this look--Sophie and Trey is so amazing! Those little babies were so cute--the ig photo was adorable :) Glad you had a great weekend! Such a cute top! I love that it is pleated. Sounds like you had a great weekend! Any excuse to wear leopard! Loving these jeans too, they fit perfectly! 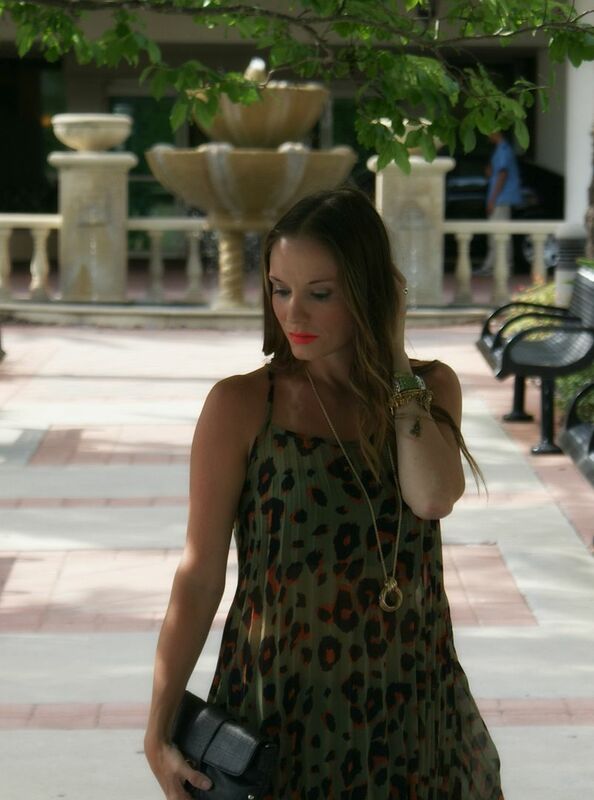 The leopard and orange lipstick is such a gorgeous look on you! Love your lipstick with this leopard print! Stunning! Oh wow, this outfit is incredibly flattering on you. Those jeans create a very good line.